Created with leading electronic music duo Infected Mushroom, Pusher is an innovative multiband sonic enhancer and limiter/clipper that delivers Infected Mushroom’s “secret mixing sauce”. 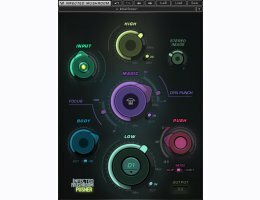 Pusher brings together high-end processing and Infected Mushroom’s decades of mixing experience to give you enormous possibilities for boosting frequencies, enhancing sounds, and mastering full tracks for any genre or style. Whether you’re preparing your music for a release or to play out in clubs, you can use Pusher to add grit to your drums, add brightness to your instruments or push your whole mix to the max – all in a matter of seconds. Pusher is also low-latency, so you can freely use it in the studio or live on stage.